and dish is indigenous to the Philippines. can add more vinegar or soy sauce to accommodate your taste preference. If one day you want a darker sauce, then add more soy sauce. If you wish to make it completely gluten-free then make sure that the soy sauce you are using is wheat-free. – either way it’s truly flavorful. As you can see in the photo below, the chicken pieces are quite golden brown. I do fry my adobo after they have been cooked – just a little oil (and a bit of the sauce) and not deep-fried – to give it a little color and extra flavor. But this last step is optional. The extra sauce that’s left on the pan I use to drizzle on my rice. first day.). 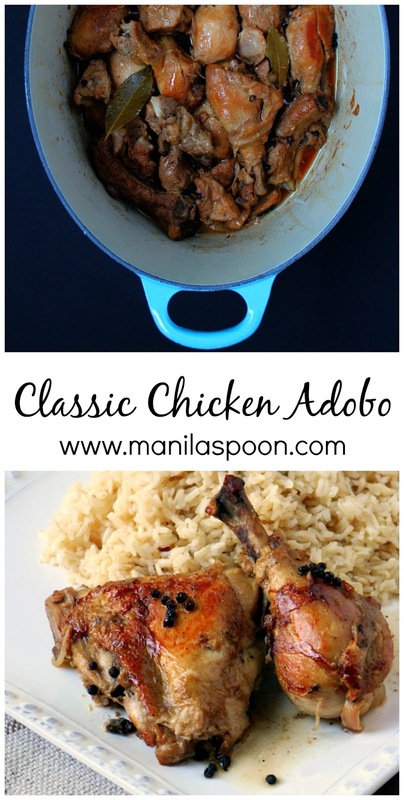 Of course, you can also marinate the Adobo in its sauce the night before and cook it the next day to ensure that the chicken has fully absorbed all the flavor. Place the meat and the rest of the ingredients in a large pan like a Dutch oven. You can also marinate the meat overnight prior to cooking. heat, bring to a boil. Adjust the heat to the lowest setting and cook uncovered for 20 minutes. This helps mellow the taste of the vinegar. the chicken (and pork) pieces are tender about 30-40 minutes. When the meat is already tender, sprinkle the brown sugar on top. Gently stir to allow sugar to be absorbed by the meat. Cover and cook for another 2-3 minutes. This will not really sweeten the adobo but just help enhance the flavor and add a little caramel glaze to the meat. The adobo is already yummy at this time but its taste improves as it ages. And don’t forget the rice – lots of rice as this is a particulary more-ish dish. For a “dry adobo” you can simply reduce the sauce until it has almost evaporated. The chicken and pork pieces will then begin to fry on their own fat left in the pan. My family in the Philippines like it this way. Or, you can just take out the cooked adobo meat and fry them separately in another pan with a little oil and some of fat from the sauce and then use the remaining sauce (which you can reduce to thicken it slightly) to drizzle on your rice. The sauce is also great for making fried rice so don’t throw it away. Anyway, enjoy! updates and so much more. Thanks for visiting and happy browsing! 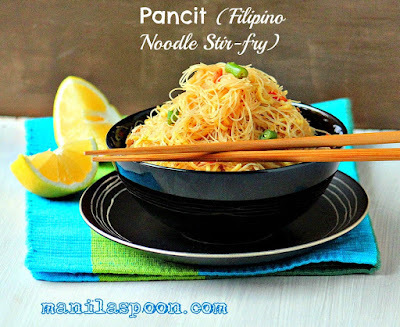 Love to see more Filipino recipes? Try some of these! I love chicken adobo! I get to eat it a lot as many of my students are Filipino. Yum! And I didn't realize the word means 'marinade' but that makes total sense! Glad you like Adobo, Tiffany! That's wonderful to know. Thanks for stopping by. Thanks for posting this one.. I tried making adobo too but I always miss something in it…. and my husband don't like it….so I stopped making this recipe…. I hope that by following your recipe it will be a success this time…. I sure hope so too Chrystelle! Enjoy! 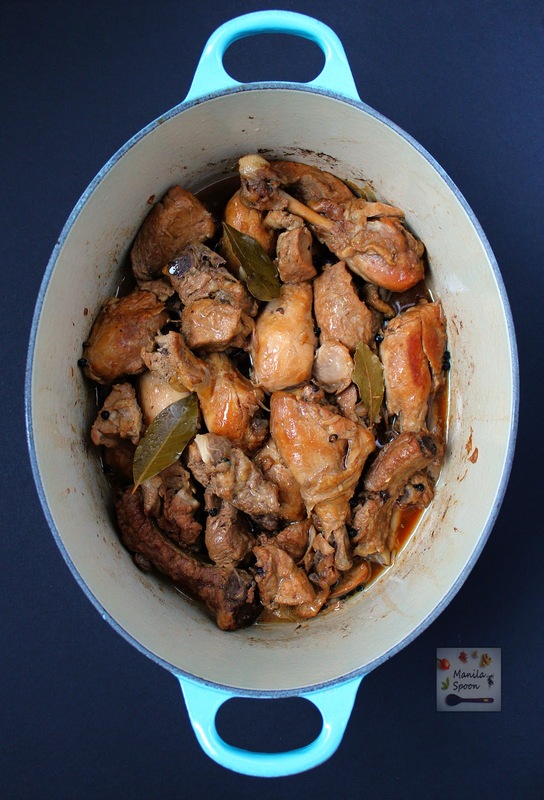 Chicken Adobo is one of the world's most simple — and delicious — dishes. Yours looks fantastic! Thanks, Adam. So very kind of you. Hey, You have made me hungry. Hi Bintu, I get hungry whenever I see these photos, too. 🙂 Thanks for stopping by. 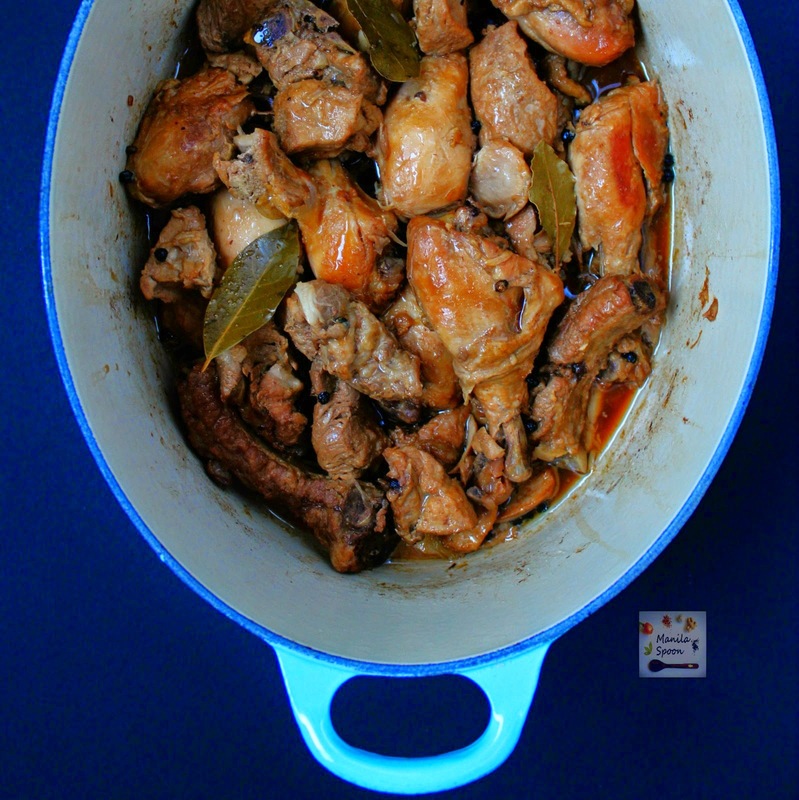 My Chicken Adobo version is with abundant sauce! and sometimes I make it with pork too! Love this! Chicken adobe is one of my favorite dishes. Where do you find fresh bay lead? Thanks, our grocery store carries fresh bay leaf. This is in Michigan not Manila. Thanks for this recipe! I'm curious though, would it make a difference if you peeled the garlic? I think if you leave the garlic unpeeled, it tastes sweeter whereas if you leave it peeled it becomes pungent. Thanks for stopping by. This looks fantastic! I love all your recipes, so versatile and delicious! 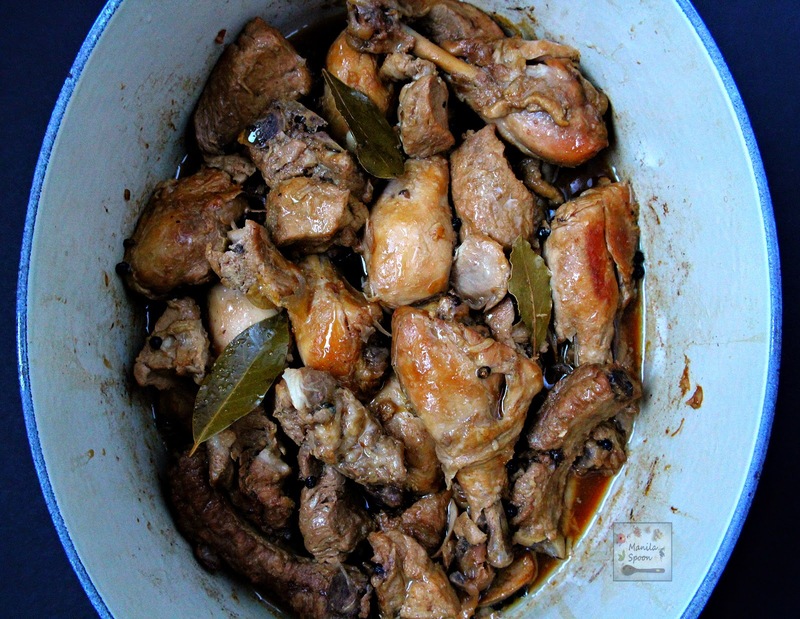 My absolute favorite… I love a good adobo, and I didn't know until now how simple it was! Thank you for your chicken adobo recipe. I have a question about what should I do to make a little more sauce for the side? I would like to make more sauce to the chicken and rice on the side. Should I double the amount of soy sauce and vinegar or will that over power the chicken? I think it makes enough sauce for drizzling on the rice – the photo just doesn't show it. You can certainly adjust the amount of sauce (vinegar and soy) to taste but I will do it in tablespoons rather than by cups (or less) so it won't be too strong. Thanks for asking Jane! Thank you for your wonderful recipes. I make lumpia, adobo & pancit. I prefer my adobo without frying but that is the way my great and still friend from Iloilo first made it for me. Now, however, I sometimes add coconut milk after the chicken wings and the pork are finished cooking down to a thick sauce. 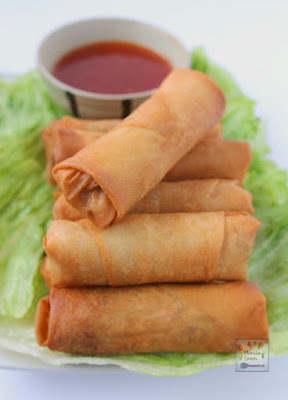 I make my lumpia using 1/2 mild italian sausage and 1/2 veggies. I also make mine thinner and we dip in sweet chilli sauce. I dip mine in patis. I've never been to the Philippines but I've managed a great amount of Ilongo and some Tagalog. I'm now 76 years old and not healthy enough these days to travel. You're too young to know Kundiman but it's my favorite Filipino music. Keep up the super and kind sharing of your great recipes. Thank you for stopping by! I am glad you did and thanks for the tips as well, I may have to try those one of these days. Take care and keep on cooking! This is by far the best adobo that I've tried. I have yet to try your other recipes but I'm confident they should be as good as this. Kudos! What do you mean by “cooking the vinegar first” ? Cooking the vinegar allows it to mellow down so it’s not overly sour and overwhelming.